When you have a special diet, eating out can be difficult. Restaurant menus often do not list all of a dish's ingredients, and sometimes the wait staff is not fully informed about how menu items are prepared. The Forklift & Palate restaurant aims to give every customer who dines with us a great experience, no matter their dietary restrictions. We have menu options for those who follow a gluten-free diet and those with food allergies. Our menu also has dishes for vegans and vegetarians. What Do Vegans and Vegetarians Eat? Our menu options for vegans and vegetarians focus on grains, fruits, and veggies, which make for healthier dining — and even if you aren't vegan or vegetarian, you'll likely still find these dishes delicious! Both vegetarians and vegans avoid eating meat, and vegans follow additional dietary restrictions by not consuming any animal byproducts. They also avoid using other products (like leather) that came from animals or were tested on animals. No matter if you're a vegetarian or a vegan, we're sure you'll love our vegan or vegetarian meals at Forklift & Palate! We strive to make sure your meal is prepared to your liking. Upon request, we can remove or substitute ingredients from menu items in order to ensure it falls within a vegan or vegetarian dietary restriction. 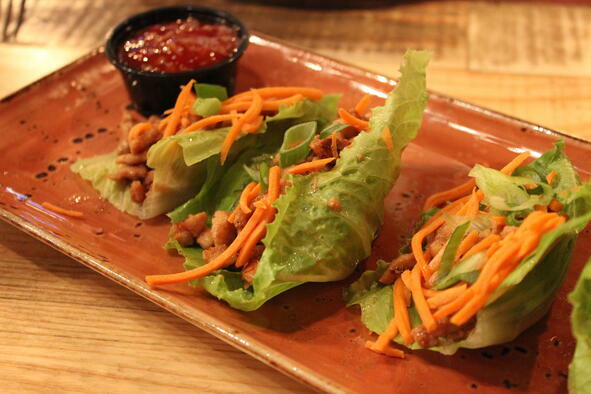 You can enjoy a tasty vegetarian meal at any time of the day at Forklift & Palate. Try our French Toast, Buttermilk Pancakes, Waffle or Oatmeal at breakfast. If you include eggs in your diet, you can also order our Vegetable Cheese Omelet. At lunchtime, you have a wide selection of crunchy and filling salads, like the Taco Salad. If you're looking for something besides a salad, try our Veggie Burger or one of our unique flatbreads. When it's time for dinner, order the Caprese Salad if you're looking for a lighter meal or the Roasted Vegetable Curry. Either choice makes for a great meal to end your day. Finish off your lunch or dinner (or both!) with a sweet dessert. Try our local, handmade ice cream, creme brulee or ice cream sandwich. Any of our desserts make the perfect conclusion to a great meal. Like our vegetarian options, we have several vegan dishes to choose from on our menu. For a light lunch, try our Chef's Hummus. Enjoy the smooth, creamy hummus with celery and substitute the pita chips. You could also order the Sesame Ginger Salad, just make sure to request leaving out the wonton strips. The crisp mixed greens and juicy mandarin oranges are topped with a tangy sesame ginger dressing. When you stop by for dinner, try our Fresh Peach Bruschetta. If you're craving something a little sweet, this is a great pick. The peaches are drizzled with basil honey and the baguette can be replaced with another item. If you want a veggie-packed meal, order the Quinoa Salad. You'll get a mix of quinoa, avocado, cucumber, tomato and green onions topped with an apple vinaigrette. Forklift & Palate is dedicated to ensuring everyone has a delicious and satisfying meal at our restaurant, no matter your dietary restrictions. Contact us today for more detailed descriptions and explanations of how our food is prepared or make a reservation. Check out our chef’s most recent food and drink creations . . .